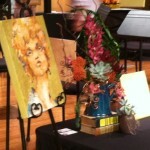 We were so thrilled to have four designer’s participating in this year’s Arts & Flowers benefit this last Saturday. 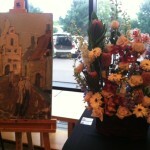 It was a wonderful night of music, delicious food, fun people and of course beautiful art and floral arrangements. 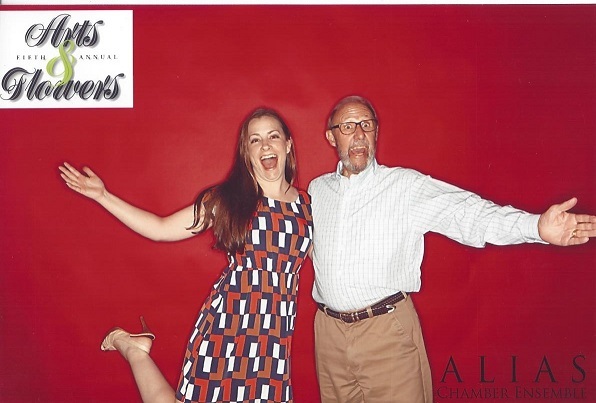 All proceeds including ticket, floral and art sales go to Emmy winning Alias Chamber Ensemble. 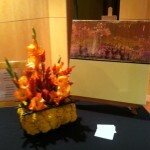 www.aliasmusic.org Our own Rachel Smith’s design was one of the first floral pieces to sell!! Below are some amateur photos of these professional pieces. Derek’s design had an asian bonzai feel. 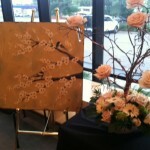 His hand made tree adorned with quicksand roses and fluffy base of gerbers and hydrangea earned him the Best Florist award. Liz’s traditional planter arrangement of roses, gerbers, delphinium, tropical king protea and cymbidium orchids. Rae’s modern motif included a yellow yarrow base, a hand crafted cane lattice topped with orange and fuschia glads and celosia. Diane’s contemporary chic pitcher of tropical orchids, pincushion protea, and succulents. Thanks to York & Friends art gallery for organizing and bringing all the artists together. yorkandfriends.com We look forward to this event every year and are happy to meet new friends. Next post: Fall Wedding Season is right around the corner!! !